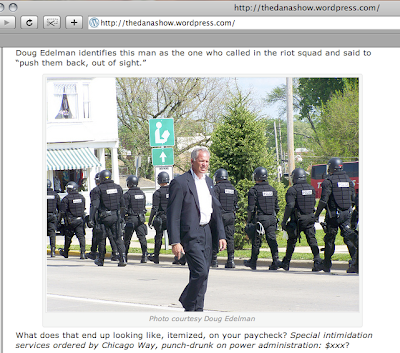 I wrote previously about how the tea party managed to contradict their own ridiculous claim that "President Obama's Team" personally sent riot police out to intimidate them at their Quincy, IL protest. But several of them (Dana Loesch and Jim Hoft come to mind) have also been claiming that the Quincy Police Chief was "lying" or "spinning" in his statement. According to St. Louis tea party leaders, the tea partiers politely followed the rules the whole time. Unfortunately for them, their own videos prove them wrong. A group of individuals positioned themselves on the south side of York Street near 3rd Street. This was within the area that was to be kept secure at the request of the U. S. Secret Service agents in charge of the site. Prior to the event only ticketed individuals were to be in this area; during the event it was restricted to the general public completely. Secret Service personnel requested these individuals leave the area and to go back to the north side of York Street. They did not comply. Quincy Police Department personnel made the same requests and again they did not comply. At that time the MFFT was deployed to stand post between the individuals and the site and, if necessary, remove the individuals. Once the MFFT was in place, the individuals agreed to move. Once everyone complied and the site was again secure, the MFFT returned to their staging point. No physical force was used during this deployment. To me conservativsm is about NOT BEING A VICTIM. No wonder he's sick of the St. Louis Tea Party Leadership. There's no bigger group of crybabies, whiners, and FAKE VICTIMS around! Oops! 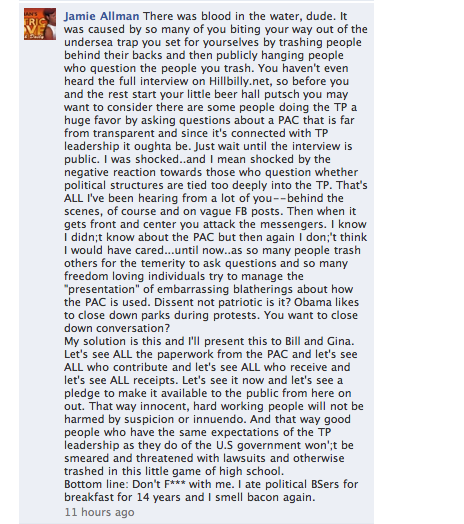 Gateway Pundit Disproves Tea Party Conspiracy Theorists...including Gateway Pundit! 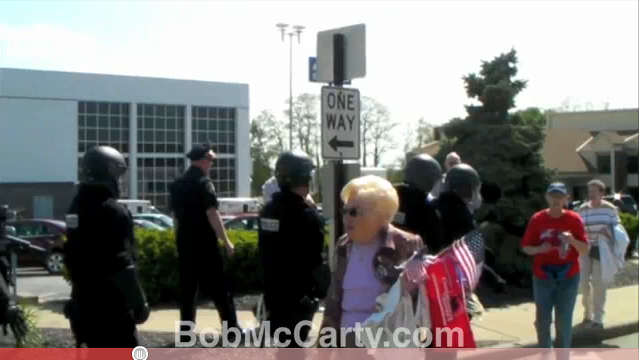 Jim Gateway Pundit Hoft wrote a triumphant blog post today claiming that the tea party's "army of videographers" disproved the statement by the Quincy Police explaining why the riot police were summoned during yesterday's protest of President Obama. Who knows if his claims are true, given that the Tea Party has a known record of deliberately editing video to be misleading and worship at the feet of Andrew Breitbart and James O'Keefe, the two people who's names are practically synonymous with "misleading editing." The Quincy Police Department released a statement today following the embarrassing incident yesterday when they called in the SWAT squad to quash the peaceful tea party protest outside the convention center during Barack Obama’s visit. Loesch, being the top-notch schmournalist that she is, gets the inside scoop on who *really* ordered the riot police out from Doug Edelman, a guy who believes that President Obama is not a citizen of the United States. My personal theory: they're trying as hard as they can to distract from the fact that they only got 150 people to protest Obama. Actually, it's worse than odd. It's repulsive, considering that Arizona just passed a new law that legalizes racial profiling. Keep that in mind next time Loesch tries to present herself as a champion of civil rights. We've long had our suspicions. You could tell by the way they stared just a little too long during the national anthem. Or by how they'd mysteriously disappear together for long periods of time at the shooting range. Or by how they'd always tilt their lawn-chairs ever so slightly to face each other during rallies. Yes, we knew there was definitely something going on. But yesterday the MO GOP and Tea Party made it official: they are forever united in holy astroturfimony. 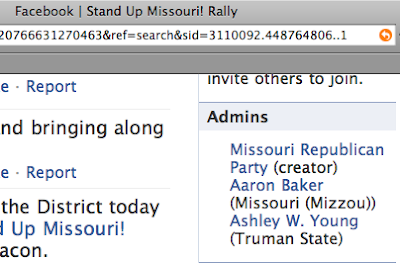 After I wrote that the Missouri GOP was advertising a "tea party rally" from their facebook page, the relationship was comfirmed by Aaron Baker, Aide to Republican State Senator Bill Stouffer. Baker alternately tweeted about the event as a Republican event and as a tea party event. I, for one, am glad it's finally out in the open. No more late-night trysts. No more nervous giggling when God Bless America starts playing on the cell phone. The relationship is now official, so let's just stop pretending that the tea party leadership ever really wanted anything other than a return to the Same Old GOP. Is it too much to ask that the people running for Congress are at least dimly aware of what's going on outside of the right-wing propaganda bubble? Apparently it is for former Matt Blunt Chief of Staff Ed Martin, currently running for Congress in Missouri's 3rd District. If the above stream isn't working, click here to watch the debate. (PS I'm not filming the debate, just using the live streem from Wash U Climate Justice). Join Tea Party Patriots, concerned Americans, and special guests as we take back our country at the Stand Up Missouri! Rally—just down the road from the site of President Barack Obama’s visit! Pretty grassrootsy, no? The site created for the event, Stand Up for Freedom, generally avoids mentioning that is this a Republican Party effort except for a few small hints. They also are sending out press releases as the Republican Party, as reported in the St. Louis Beacon and KTVO3, so obviously this is a rally organized by the Missouri Republican Party. Obvious, that is, unless you get your news from the St. Louis Tea Party, who claim as they promote the event that the rally is being organized by the Macon, MO Tea Party and who make absolutely no mention of the Missouri Republican Party in their promotion. Funny how the St. Louis Tea Party, recently under attack for being, " recently accused of being "hijacked by the Republican Party," gets so confused about these things. Panelist Gwenne Stewart-Hayes, Executive Director of Gateway Greening, describes City Seeds, an urban farm located in downtown St. Louis. For those of you who didn't make Sunday's Earth Day celebration, there's still a chance this week to mingle with the green at heart. This Thursday evening, the Pulitzer Foundation for the Arts will host "Food, Art, and Community," its final panel discussion in a series fired by its current exhibition Urban Alchemy/Gordon Matta-Clark. Gordon Matta-Clark and fellow artists ran a restaurant called "Food" in 1970s SoHo, which turned cooking into performance art and provided a common space for the neighborhood to cultivate creative ventures. This week's panelists will talk about how art can work together with sustainable produce, urban farming and farmers' markets to foster community and urban renewal. You can RSVP to this event on Facebook. As some of you may already know, the second United States Social Forum is scheduled to take place this coming June in Detroit, MI. The USSF is designed to be a national movement building process that brings together grassroots organizations from around the country to collectively share vision, strategy, and victories. The USSF prioritizes the involvement, leadership, and struggles of those who are most impacted by the systems of oppression we are up against, namely people of color, women, queer people, low-income people, and youth. By bringing together various progressive and radical forces in the country the USSF hopes to facilitate the emergence of a stronger left based movement on a national level while also supporting and strengthening the work organizers and activists are doing in their local communities. The Justice Institute is an organization here in St. Louis dedicated to bringing together progressive activists and organizers in order to deepen analysis through collective study, increase consciousness through popular education, and create movement building spaces where progressives can engage in dialogue and support joint action. The Justice Institute is currently working to organize a contingent of 30 people to go to the United States Social Forum. We are actively seeking to prioritize the involvement of people of color, women, queer people, low-income people, and youth. We believe the USSF offers St. Louis organizers and activists a unique opportunity to connect with other progressives around the country and build stronger organizational alliances locally. Our goal is to organize individuals and organizations from St. Louis involved in going to the USSF to continue to meet after Detroit to further collaborate on collective action and support each other’s work. We are estimating the cost of this trip to be $350 a person for a total cost of $10,500. We are asking you to donate $25, $50, $75, $100, or any amount with which you feel comfortable in order to support our efforts. You can donate by clicking on this link. We are currently soliciting funding from the national Jobs with Justice Scholarship Fund for the USSF as well as the RESIST Foundation. The most we will be able to receive from this funding is estimated to be $3,000, so in order to reach our goal of sending 30 people to the USSF we have a significant amount of grassroots fundraising to do. We appreciate all of your support and contributions to this cause. Monday, April 26, the Young Democrats of St. Louis are having their monthly meeting at Maggie O'Brien's at 7 PM. Also Monday, Pride St. Louis is having a community meet-up at 7 PM at Mokabe's 3606 Arsenal to discuss plans for the upcoming PrideFest 2010. Also Monday, Lindsey Tomlinson will be performing at the Co-op Cafe at 6021 Pershing at 8:30 PM. Tuesday, April 27th, there will be a huge debate at Graham Chapel at Washington University about the role of Coal in our energy future! Fred Palmer, Vice President of Governmental Relations at Peabody will be debating Bruce Niles, the National Coal Campaign Director of the Sierra Club. The moderator will be Bryan Walsh of Time Magazine. Amazing! The event will be from 5 to 6:30 in Graham Chapel. If you can't make it to campus, you can host a viewing party or stream it live from your computer! Also Tuesday, there will be a Making Sense of Health Heform Education Forum at Eden Theological Seminary (in the Luhr Library: 475 East Lockwood Ave.) at 7 PM. Don Marsh will be moderating. Also Tuesday, the Burning Kumquat at Wash U will be screening A Chemical Reaction, a movie about the dangers of pesticides, at 6:30 PM in January Hall Room 110. Also Tuesday, Amnesty International of St. Louis City has their monthly letter writing meeting at PM at the Hartford Coffee Company (2974 Hartford). Also Tuesday, the West End Grill (354 N. Boyle) will be holding a Vegetarian Wine Dinner from 7 to 10 PM. Wednesday, April 28, NARAL will be taking a bus to Jefferson City for a Pro-Choice Lobby Day. The bus leaves at 7:30 AM and gets back around 5:30 PM. Also Wednesday, Valerie Patton, the Executive Director of the St. Louis Business Diversity Initiative, will host a conversation on Cross Cultural Mentoring at the YWCA "So Reel" Brown Bag Series at 11:30 AM (2711 Locust). Also Wednesday, RAVEN will be leading a discussion on sexual violence prevention at Tegler 105 on the SLU campus from 4 to 5 PM. Also Wednesday, members of the Missouri Supreme Court will be on hand at Webster University's Pizza and Politics at 6 PM at the Sunnen Lounge of the university. Also Wednesday, at the April Schlafly Science on Tap, Professor William Orthwein will discuss the role of judicial independence from 7 to 8:30 at the Schlafly Bottleworks. Also Wednesday, Washington University students are asked to pack the senate at Simon 120 to encourage the Student Union to vote yes on a resolution requesting increased Increased student participation and oversight in investment decisions, & harmony between investment decisions and the University's mission statement. The meeting is at 9 PM. Thursday, April 29, there will be an all day workshop on improving low income and minority communities access to wealth from 8:30 AM to 4:30 PM at 12777 Olive St.
Also Thursday, the Organization for Black Struggle is kicking of a signature gathering campaign in their Justice for Reggie effort. Also Thursday, buy a cupcake in the Danforth University Center Commons at Wash U from 11 AM to 2 PM and support Kiva, which supports entrepeneurs in developing countries. Also Thursday is Dine Out for Life, a night where a number of local restaurants donate a percentage of their proceeds to fight AIDS/HIV. The official web site is here for all of the listings, and there are a large number of facebook events for various locations, including here, here, here, here, here, here, and here. Also Thursday, the bARTer Collective RV will be bartering on Cherokee Street (at Texas, across from Globe Drug) from 5 to 7:30 PM. Also Thursday, there will be a benefit for the Co-op Library at the Wash U Co-Op from 7 to 11 PM at 6021 Pershing. Also Thursday, author Areva Martin will be discussing her book The Everyday Advocate: Standing Up for Your Autistic Child at Left Bank Books (399 N. Euclid) at 7 PM. Also Thursday, three outstanding international journalists from the Pulitzer Center on Crisis Reporting will be sharing their experiences from 7:30 to 9 PM at 5:30 E. Lockwood. Also Thursday, Engineers without Borders will be playing Hold Em' for Haiti from 7:30 to 10 PM at the Danforth University Center at the Wash U campus. Also Thursday, the Pulizer hosts Food, Art, and Community at 7:30. See the post on the Activist Hub blog for more info! Also Thursday, The Yes Men Fix the World will be playing at the Webster Film Series at 7:30. Also Friday, there will be a PRIDE Stuff Making Party in Edwardsville, IL at 7 PM. Also Friday, the Good Gawd James Brown Tribute at Off Broadway (3511 Lemp Ave) will be raising money for KDHX fro 8 PM to midnight. Saturday, May 1 five miles along Locust and Lindell will be car-free and open to bikers, walkers, etc. Also Saturday, thousands will march for Immigrant Rights starting at America's Center (710 Convention Plaza) at 11:30 AM. Also Saturday, celebrate International Workers Day with a number of amazing events throughout the day (1 PM to 8 PM) on Cherokee Street. There will be a rally from 5 to 5:30. Also, Haymarket Martyrs and the Chicago Anarchists, May Day and the 8 hour day, Yes! In My BackYard!, and a concert by the May Day Orchestra. Also Saturday, there's a call for art and service for Michael Long, who fell 40 ft off a billboard and was severely injured, from 2 to 10 PM at the Shanti (825 Allen in Soulard). Also Saturday, there will be a March to the Arch for Marijuana Liberation Day (protesting the current draconian laws around cannabis) starting at Kiener Plaza (Market and Broadway) at 3:30. Saturday is also the kickoff of an amazing week of events at the Chautauqua Art Lab Week. Check here for the full schedule. Also Saturday, House of Style STL kicks off Project Green at 5 PM at Maryland Plaza. Also Saturday, there will be a Trivia Night for Children's Christian Formation classrooms from 6:30 to 10 PM at 3310 S. Grand. Sunday, May 2, and every Sunday, the Instead of War Coalition holds a vigil for peace at the corner of Grand and Lindell at 7 PM. Also Sunday, The Yes Men Fix the World will be playing at the Webster Film Series at 7:30. I wrote previously about how Kevin Jackson called St. Louis Tea Party leaders John and Gina Loudon, "the biggest two crooks in St. Louis." Jackson was a frequent speaker at Tea Party events, and was the emcee at last year's tea party rally on April 15 in Kiener Plaza. I've tracked down some additional comments from Jackson about the Loudons and his thoughts on the Ensuring Liberty Political Action Committee at the heart of the controversy. Geez, you think Jackson is mad at his former publicist? One last note about the conflict. 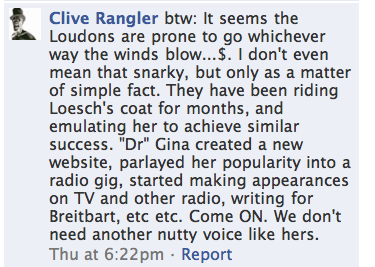 Someone named Clive Rangler commented on Kevin Jackson's post that Gina Loudon had been riding Dana Loesch's coattails to success. Wow. The tea party is usually pretty good about circling the wagons and trying not to let anything out to the public. But I guess when the cracks appear there's lot of animosity waiting to burst out! The Hillbilly Logic radio program kicked off the current flurry of controversy in the St. Louis Tea Party simply by asking questions about how the Ensuring Liberty PAC worked. They hadn't heard of it before, and so asked their guest Gina Loudon about the structure of the organization, as well as the St. Louis Tea Party's relationship with national organizations. Rather than answering those questions, according to Hillbilly Logic member Kevin Harned, the tea party leadership responded with "insults, innuendo, and accusations." 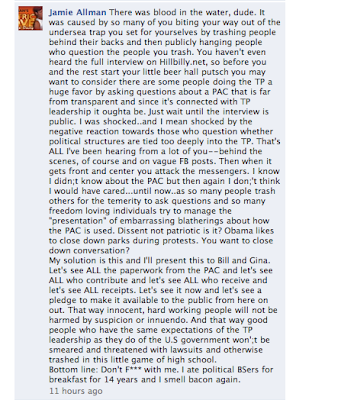 Harned goes on to say, in response to a commenter Steve on his blog, that Steve was the first person in the tea party to respond in a way that didn't accuse him of being "the enemy." He mentioned that the tea party leadership treats anything that is not praise as an attack. And he says that they even accused him of "being a plant" simply for asking questions about how their organization works. Again, and I know I've said this many times, why wouldn't the tea party respond simply by being more open and transparent about their records? They're attacking people who ask for clarification. Bill Hennessy is dodging questions about his new Ensuring Liberty corporation. They're eating their own. But why don't they simply answer the questions? Ed Martin Spins While Tea Party Fights...Itself! Ed Martin, even after being corrected, is still amazingly trying to spin a ridiculous story about how Congressman Carnahan is "avoiding taxes" because Rep. Carnahan's co-owned, inoperable boat is docked in Alton. This takes an amazing amount of gall from Martin considering that his ruthless persecution of a whistle-blower as Chief of Staff for the Blunt administration cost the state of Missouri $2.1 million in taxpayer money! And he wasn't even done then: he later filed a lawsuit dismissed by a judge as frivolous, that even Martin himself described as a "nuisance"! Also, it looks like Martin might have hitched his opportunistic wagon to the wrong horse. Members of St. Louis Tea Party are fighting amongst themselves over allegations about a new Political Action Committee. Tea Party leader Bill Hennessy called 97.1's Jamie Allman a "stammering, pausing idiot", Allman called Hennessy a "sad, psycho typist", and former tea party emcee Kevin Jackson called Tea Party leaders Gina and John Loudon "the biggest two crooks in St. Louis" (7). It's getting pretty wild, and it's not clear at all whether the tea party will be able or willing to address the issues underlying the allegations. Note to Media: We Beat the Tea Party! My birthday has passed and I can now officially say that I raised more money in two weeks for my birthday than the entire St. Louis Tea Party's "Stop the Prop" campaign that resulted in a wave of media hype and predictions that Prop A would go down in flames. In their two month campaign, the St. Louis tea party was only able to raise $870 in donations from about 25 people to oppose Prop A. In the two weeks prior to my birthday, I raised $942 from 34 people. Yet the media, in all of its extensive coverage of the Prop A opposition, never once questioned whether the tea party opposition was really a legitimate group with "grassroots" support and even used the occasion to hype up what a "political force" the tea party was. In fact, even after Prop A passed with about as big of a margin as one could imagine in St. Louis County, the media was still making excuses for the Tea Party by saying that they only had $900 against the large money in support of Prop A. Well, that excuse is no longer available to the tea party. I, someone who is not connected to the political establishment who has no particular fundraising ability, was able to out-raise their opposition in 1/4 of the time period, simply with the help of a few of the good people I know. The prop A opposition promoted their efforts on the radio, on a huge number of local and national blogs, including Gateway Pundit's blog (which is one of the top ten most read political blogs in the country), through their email lists, and via friendly media coverage. 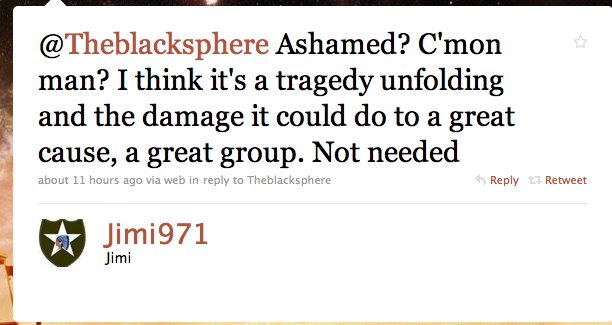 I promoted mine only through my blog, facebook and twitter accounts (and a few friends who reposted the info). Yet my side raised more money from more people. The excuse that the tea party didn't have enough money no longer is coherent. The fact that they didn't have money was a symptom of their lack of ability to organize on this issue, not a cause. If they were able to organize on this issue, they would have raised more money. Period. So there are two options left to explain the tea party's huge defeat. One, maybe they picked a great issue but are just completely inept at organizing. Or two, maybe the exclusive leadership of the tea party picked the issue without consulting their base and then found out the hard way that this was not really an issue that their membership cared about. The latter explanation certainly appears to be the suggestions of friend-of-the-tea-party Jay Stewart on the Hillbilly Logic radio program (2/3 of the way through). Either way, however, it is now beyond argument that the tea party failed massively on this initiative, and it would be nice if the media started reporting it as such. So anyway, thanks to my great group of friends and fellow fighters for a better world for the donations to a noble cause. Joan, Margaret, Brenda, Barbara, Lara G., Julie, Jonathan, Mark, Craig, Anna, Bunny, Sean, Paddy, Sally, Ian, Nick, Sonia, Michelle, Jill, Joe, Maggie, Tom, Liz, Mindy, Ben, Jen, Annette, Lara C., Indio, Jessica, Amy, Jimmy, Adam H., Steve, Matt, and Luella: your donations are greatly appreciated and I know they will be used wisely in the fight for economic justice. It feels great to have such a supportive group of friends! Allman Via MOPNS: "Hotheads" and "Sad Psycho Typists"
Wow. Quite the reaction from some hothead TP Leaders today! I think it was because some of us questioned whether party political operatives are taking too much charge of the TP movement. It was the TP leadership’s association with a PAC that got some of us wondering what was up. It was also an interview with Gina Loudon by the Hillbillylogic.net guys that started it all. About two hours after I indicated we need to be asking for more transparency of the TP Political Action Committee–ELPAC–that Bill Hennessy, a nice guy turned sad psycho typist, let loose a tirade against me as a “failed reporter” who was jealous because I was not a Tea Party leader. A guy who finally found gainful employment within the past two years has a lot of nerve wizzing on 14 Emmys, but I’m used to that! And as for a Tea Party leadership thing I rejected the invitation last year because I always said, from day one, that it was not my position to be an activist. I have and always will be a broadcaster and I think I do plenty of bullhorning three hours a day so say what you will. I’m also really bad at wowing crowds. I’ve always had a lot of respect for Bill and the other leaders. It’s a shame he couldn’t handle his angst. As has been documented here, several prominent local conservatives, including 97.1 radio host Jamie Allman, author Kevin Jackson, and the Hillbilly Logic radio crew, have raised questions about the transparency of the St. Louis Tea Party's Ensuring Liberty PAC. This is on top of allegations a couple weeks ago from @JanSimpson that the tea party was using their organization to make money from political candidates. Ensuring Liberty is a 501(c)4, and its affiliated PAC, the Ensuring Liberty PAC (ELPAC) were formed to address the next step in the growing impact of the conservative movement through issue advocacy, fund raising, candidate recruiting and most importantly, the development of a Congressional Caucus of like-minded representatives that stand for our First Principles. As we have decided until primary issues have been resolved, the PAC has not yet been established, candidates have not yet been chosen and thus no money has yet been raised or distributed. Transparency for the PAC is required by FEC rules and will be followed to the letter and spirit of the law once established. So did Hennessy really address the questions? It sure seems to me that the people asking questions were really interested in transparency for the organization in general, not just for one particular facet of it. Any of the problems you might have from raising money for a PAC would surely be at least as prevalent in raising money for a nonprofit corporation. Does Hennessy really not recognize this, or is he being deliberately opaque? Twitterer @Jimi971, a close friend of Dana Loesch, was arguing over Twitter with Kevin Jackson after Jackson unleashed a series of highly critical comments about St. Louis Tea Party leaders Gina and John Loudon. A central part of Jackson's criticism is that the Loudons were misusing the new Ensuring Liberty PAC. Ensuring Liberty was also at the heart of the criticism directed at the St. Louis Tea Party by 97.1 radio host Jamie Allman and the Hillbilly Logic radio crew. My solution is this and I'll present this to Bill and Gina. Let's see ALL the paperwork from the PAC and let's see ALL who contribute and let's see ALL who receive and let's see ALL receipts. Let's see it now and let's see a pledge to make it available to the public from here on out. That way innocent, hard working people will not be harmed by suspicion or innuendo. And that way good people who have the same expectations of the TP leadership as they do of the U.S government won't be smeared and threatened with lawsuits and otherwise trashed in this little game of high school. 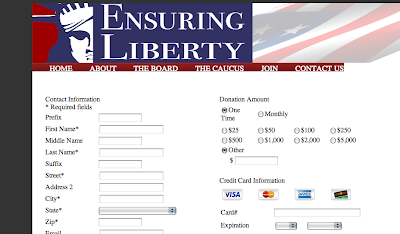 I should just add: this shouldn't apply only to the PAC, but also to the many other ways in which the Tea Party generates income, from the $25,000 dollar Conservatives of America glorified website to the tea shirts and hats they sell to the Ensuring Liberty corporation. That's not too much to ask, right? If they're criticizing the government for a lack of transparency, then surely they can be transparent in their own organization? The tea party often hilariously likes to pretend that it is a "grassroots movement' that is independent of the Republican Party. But in a stroke of irony so majestic that some have claimed it as proof that there is a omnibenevolent, omniscient, omnipotent creator of the universe, it turns out that the tea party movement is not only funded by wealthy Republican donors, but in fact is funded by wealthy Republican donors who owe their fortunes to the Josef Stalin regime. The tea party in St. Louis is no exception, crucially owing their beginnings to Americans For Prosperity, one of the groups funded by the Koch family. I think you should have shortened some of the speakers today to allow some of the other candidates speak. really made the tea party today look like a Ed Martin campaign event. as a "movement" you should support ALL Conservative candidates and allow people to hear from them and make an informed decision. Informed public make better decisions. An Ed Martin event! You have got to be kidding me. What candidate that didn't get to speak are you writing this comment on behalf of? Ed spoke for 15 minutes as he was one of the 3 keynote speakers along with Dana and Bill Hennesy. All others were given up to 10 minutes. Stop the whining! Horton's response was completely ridiculous. If the Tea Party was really independent of the Republican Party, would they have Republican candidate Ed Martin as their headline speaker and give him more time than everyone else? Ed Martin's primary opponent, John Wayne Tucker, was not even given any chance to speak. So clearly, this "tea party" was taking sides with the Republican political establishment and not even allowing the other side to speak. the statement on the left says "The Tea Party mission is to unite like-minded individuals, educate and inform others based on our core values, and to secure public policy consistent with those values." Does calling me a whiner unite?, there are others that "liked" my comment so they must have agreed with what I said. I liked the event for the most part. I appreciated the fact that the event allowed conservative speakers from the Dem, Lib, Const, and repub parties. Great Job there. BUT, and this was my point in the original comment. There were 3 candidates there that Ken introduced, then stated that due to time not everyone got to speak. those 3 people were there and did not get the opportunity to speak. SO, if some of the others had cut 2-3 minutes out, these 3 candidates could have spoken. If this is not a tea party for all conservative candidates, just say so, again that way the public will know for sure if they want to participate in this tea party movement or not. I was at the first tea party gathering in Jefferson County last year when we met outside the City Hall in Festus, and I attended this gathering as well. My intention was not to so much bash the work done at this Tea party, but to offer a suggestion to make it better and more affective. our races as with many in this county have multiple candidates running for the same office.I'm tired of the only person getting the ear of the public being the guy the "Political Machine" endorses and the others since they dont have the financial backing of the Machine dont get fair consideration. I feel, and I say this as its my opinion, that the Tea Party should be working to correct this type of thing and help ALL conservative candidates get heard, so that the primary races get the best candidate to run in the general election and not just the guy with the most political connection or the most money. We can all see what that gets us. So here we have a guy wondering why the tea party isn't acting independent despite claiming that it is, who is then mocked and censored by the rally organizer. Pretty good evidence that the tea party is nothing more than Republican Party business-as-usual. Kevin Jackson: "Gina and John Loudon are the biggest two crooks in St. Louis"
Gina and John Loudon are the biggest two crooks in St. Louis. Gina is saying that I hit on her (LOL! ), spent her political capital (doesn't exist), and wrote part of my book (as if!). She was worthless as a publicist (a FRAUD), and they will do ANYTHING for money, including using their "chirrens!" You want war LOUDON, you GOT it! I can back ALL my words up! They started a PAC, so they could rob good conservatives of their money. These people will be funding their LIVES with this money. EVERYTHING they do will fall under the "PAC." They will be like rogue salespeople with expense accounts! And they tried to hide the PAC, then made John Loudon the Chairman of the PAC! All associated with the St. Louis Tea Party, which they CLAIM is not political!! Dissent not patriotic is it? Obama likes to close down parks during protests. You want to close down conversation? Bottom line: Don't F*** with me. I ate political BSers for breakfast for 14 years and I smell bacon again. Hillbilly Logic: Adam Sharp Flown to Memphis for Covert Hit Operation Training? Jay Stewart Refuses to be Used by the Movement. First, Adam Sharp was originally going to be a guest on the program but was flown (1:30 in the audio) to Memphis for some kind of national Tea Party activity. He said he was taking care of some "movement business" which they described as "covert." At 28:30, they ask why Adam Sharp is in Memphis given that the St. Louis Tea Party says it's not affiliated with any national organization. Gina Loudon responds by saying that the tea party was involved in "things like" the undercover (read: heavily edited) videos that destroyed ACORN and that they're "constantly working behind the scenes" to do more projects like that. She also said her guess was that Sharp was working on something like that, but that Sharp wouldn't be able to tell them that much. I have no problem with Sarah Palin, Glenn Beck, who I'm not a big fan of anymore, or Rush Limbaugh...I have no problem with them making money...And I have no problem with somebody, even in the tea party, making money. The problem I have is if I feel like somebody is saying, "Well I'm doing this for liberty and this or that...and really what they're trying to do is establish themselves as being a political hit man to show someone, hey, a year from now if you wanna take someone out...It's almost like a bad guy in a movie, "why are you blowing up that city?" Well, I wanna show this guy because that way we get paid $10 million dollars...I can take this guy out. Here's the money. I would rather lose doing it the right way than win saying, "oh, let's uncover this about them." They also asked Gina Loudon about the structure of the tea party steering committee (18:20), and she largely avoided their question. [on Prop A] You know why black people thought that you guys were doing it? Because they thought that you were trying to keep them out of West County. So what sense does it make to try to make a video to slam Charlie Dooley. What the hell sense does that make? What sense does it make to ask me to do something like that?? That's the kinda thing that's keeping black...I'm involved in it...you're like, "hey, let's try to infiltrate this and blah blah blah and Lacy Clay." And I'm a person who's a die-hard conservative. And when you got people trying to hang stuff on people and trying to play dirty and they find out about it....I'm like, "What they hell's up with that?" A couple weeks ago, I wrote about how the Jefferson County Tea Party was following the St. Louis Tea Party's lead by holding an astroturf pep rally for disgraced Republican Chief of Staff Ed Martin. Well, it looks like that rally set off a wave of criticism of the St. Louis tea party from fellow conservatives that calls into question the motives of some of their leadership. I don't have the audio yet, but the controversy was apparently kicked off by an episode of the radio program HillBilly Logic. The show hosts, themselves avid supporters of the Tea Party's stated principles, had St. Louis Tea Party leader Gina Loudon on the show as a guest. They were surprised about the many ways in which the leaders use Tea Parties to move money around, and frustrated by the way Loudon, Hennessy, and Loesch push responsibility around for decisions (at times claiming that they are the leaders, while at other times acting as though decisions were made by the entire movement). Has the St. Louis Tea Party been "hijacked" by the Republican Party? Or are some organizers franchising it like McDonald's franchises it's restaurants Are there some people angry about money being thrown around in the McTea Party? You want some ketchup with those who may be fired? On Allman's show, which you can listen to here, the HillBilly crew criticized the Tea Party for a general lack of transparency about how their group is organized and how the money is changing hands, and for their bungled handling of the Proposition A campaign. Tea Party leader Bill Hennessy called in at the end of the show, and claimed they had, "shot an arrow in his back." The Arnold "Tea Party" was more like a political rally, with most of the time being consumed by political candidates for office. LOTS of people were seen leaving the Arnold Tea Party Rally early, presumably turned off by the speaking lineup. The leadership structure of the organization is unclear, even after questioning. 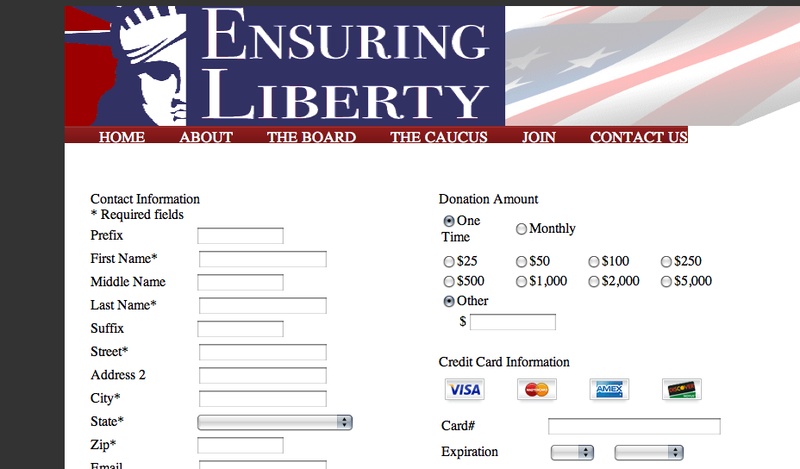 The tea party uses extreme rhetoric that seems more likely to draw donations than to draw new people. Their knee-jerk attacks against all unions and screaming rhetoric about socialists is turning people off. Some tea party speakers, like Jay Stewart, do not ask for any money. But others apparently will only speak if they are paid. Some of us are not surrounded by supportive conservative minds all day and actually try to reach out to those that support a more liberal agenda with the hope to have them be more open minded to conservatives. Which I might add we often have our legs cut out from under us by so many of the "supposed brightest conservative minds" with their thoughtless blanket typecasting and meaningless diatribe or continual name calling. I drive onto a union lot everyday with my Ed Martin bumper sticker while trying to intelligently reason with my fellow workers only to see anything that I may reach them on discarded by a St. Louis Tea Party organizer's post on Facebook asking everyone to buycott (or buy at) a particular Dollar Tree store because the union has pickets up! You can catch the same kind of reasoning on a particular local radio show on in the afternoon (hmmm, wonder who he might be talking abot - Adam)...Please stop this kind of high school behavior as you are not winning ONE heart with these tactics and helping to turn others away, and making it almost impossible for those not preaching to the choir to influence others. Unfortunately, some seem to have started to become that which they oppose as any criticism has been handled as a personal attack with a circling of the wagons and the threat of retribution to follow. Let's see... Republicans cannot criticize Republicans, same goes for Democrats, and now it appears the same goes for the St. Louis Tea Party. And the St. Louis Tea Party is different how? I have been to three Tea Party gatherings and I have never seen one flyer that contains any background information or lists the board members (or organizers) names and contact info. You cannot just assume that everyone is in your little bubble of influence or take for granted that others may be attending their first event and may not be tuned into your shows. Too many people do not know what or who makes up the St. Louis Tea Party directors. That is the organizers fault, not ours! Once again I will leave you with some advice. Do not leave the calling of the shots to the few unless the few develops thicker skin and is willing to accept criticism, and not act like a bunch of liberals by becoming self proclaimed victims. From what I see the level of professionalism displayed by those willing to admit they are in a leadership role is let's see... as Jed Clampett would say PITEEEEFULL! You all don't have to worry about others bringing the St. Louis Tea Party movement to it's knees; You are doing a darn good job of it yourselves. First and foremost I want to say that I am a supporter and friend of the TEA Party movement. With that said I saw some troubling signs at the Arnold Missouri Tea Party event. I am afraid that we may have some nice and well intentioned individuals in key places of the TEA Party movement, but some appear to be making the same mistakes that some of the small station programming directors I was speaking of did. I am afraid that because this is a grass roots movement many may lack the experience to handle the individuals pushing for the promotion of themselves or someone they represent....Having fewer speakers (and less politicians) can keep the wheels greased and rolling. You claim conservative but act just like a liberal in your arguments. While you are in your Bible check for a passage on bearing false witness! I have six years of broadcast radio experience and I can tell you that of all people you should start pointing your posts at yourself. You tell me where I was wrong about anything. I am more than happy to debate you on any live format that you want. For you to accuse anyone of a vested interest when the one thing that ALL of your National appearances have in common is the Tea Party. I would say that you have a vested interest to protect. Wondering ... if all this faction-ing lately has anything to do with a whole mess of folks heavily promoting Allen Icet on FB, Twitter? Loesch's decision to attack Icet is particularly interesting in light of Jan Simpson's criticism of the Tea Party a week ago that claimed they were supporting Tom Schweich's candidacy. Um, excuse me Kevin? Maybe you can get away with baseless, factless punditry on the show you pay to air but don't be shocked when you defame a group of people on air if they defend themselves. You got called out. The honorable thing to do would be to apologize to those you smeared for your lack of professionalism. Six years and you're still not on air anywhere? If that doesn't tell you anything, I don't know what will. I don't have time for false patriots who defame others and you can stop with the defamatory "vested interest" crap - you're the one who ran your mouth and couldn't cash it. Sad to see people I thought were on the same side buying the liberal narrative of tea party and money. Here's a thought: don't accuse others of benefitting from a movement when you used the stake in the back of that movement as a way to pull your pay-to-play show up on a radio station and attract attention by way of reporting that would make Jaco proud. Now you want airtime on my show after that hatchet job? That's rich. NEVER trust a hyperventilating man. Allman’s no exception. Anyway, Jamie Allman started Wednesday, April 21, 2010, on friggin’ FIRE! He had the St. Louis Tea Party by the . . . by the . . . nads? “Blood in the water,” he tweeted. I am a REAL journalist! he yelled into the mirror. Take THAT, CBS. Whatever. So Jamie Allman—ace reporter formerly of KMOV—jumped on The Story. “Money changing hands at the St. Louis Tea Party!” he declared with glee. With the piety of St. John Vianney, Jamie explained that “I strongly support the St. Louis Tea Party” and that he was exposing its Mortal Sins for All the World to Judge before the evil Post-Dispatch could get to it...But Jamie Allman is a man free of scruples. “I’m not really worried about the money, Jamie,” said Fredo. Of course not. Nor was Jamie. But Jamie’s got some envy to settle. In the end, Jamie Allman wrote a check his guests couldn’t cash. But Fredo and Rubes were revealed as publicity hounds who would do unnatural things to a dog like Allman in exchange for 5 minutes of air time. Friends deceive. There is a newsflash. The conservatives eat our own, every time. Then we have no one to blame but ourselves. No reflection or constructive criticism in this movement, thank you very much! We've got books to sell! Er... I mean, revolutions to win. Anyhow, another instructive set of events that shows how the St. Louis tea party leadership responds to any kind of criticism or reflection. They set up the movement, and they don't want anyone else telling them how it should work. I'm hoping that the same people stay in charge, because as long as they are the tea party will be about as effective at organizing as they were on Prop A, for the very reasons mentioned by Jay and Kevin. I guess that means, according to St. Louis media standards, that my birthday is now a "major grassroots uprising." I eagerly await my invitation to speak on KMOX. But those of you who read the recent poll showing that tea partiers were wealthier than the general population will not be surprised to find out that despite my lead in donors, I'm still behind in the total amount of cash. 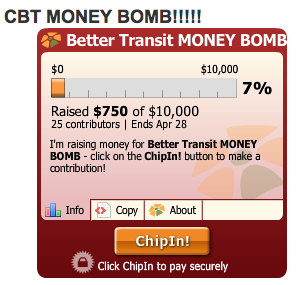 I've raised $628 so far compared to the $750 they got from their smaller base of support. But YOU can change all of that by going here and donating a small amount! As an added bonus, I'll note that Jobs with Justice will be sure to use the money strategically to work for economic justice, whereas the tea party apparently spent all of their money on Nutella and mustache trimming supplies. One final thought; 14 days after the vote on Proposition A, the Stop the Prop group has yet to update their website or email their alleged supporters. Just one more sign that this was never a serious campaign, and that our local media is way too eager to promote the narrative that the tea party is a major political force without bothering to do any investigative work. I have two items to update St. Louis Activist Hub readers regarding the StL Chapter of MADP. Hopefully, you have heard of the Missourians for Alternatives to the Death Penalty, if not, MADP should provide answers to your questions. We also are on Twitter at @MADPMO and FB Fan Page (which now you "like" instead of "become a fan"). This coming Saturday, April 24, we are hosting our first annual Spotlight Dinner. John W. Simon, long-time and tireless attorney-activist on behalf of ending the death penalty, will receive the Spotlight Award. The evening includes a silent auction, music, and dinner. I have already purchased my ticket and I encourage you to do the same. Student/Senior price is $25, Regular Ticket prices are $30. All proceeds benefit MADP’s efforts to end the death penalty. For more information or to purchase tickets, visit our website: MADP Dinner The dinner is located at 100 North Jefferson, at the Society of St. Vincent De Paul building. Music starts at 6pm - Dinner is served at 7pm. The next item I want to discuss is the legislative session. We are in the last days of this legislative session in MO. This is a good time to reach out to your representative and senator in Jeff City and let them hear from you. If they have been supportive of our legislation, thank them. If they are opposed, ask what informs their perspective. And if they say that they don’t know that death penalty moratorium and study legislation is currently stalled in House Speaker Richard’s office and Sen. Bartle’s committee, then please let Donnie Morehouse. We always appreciate opportunities to provide clarifying information to legislators. Get behind legislation currently proposed to end executions and push hard. HB 1683 is the moratorium and study commission bill. SB 591 is the repeal legislation. See our website MADP Legislation for more information. Thanks for your support to end the death penalty. It just makes sense! Monthly meeting is 1st Thursday of month, 7pm, Natural Bridge Branch CO Library. Now That's Some Kinder Hypocrisy! KMOV Now Openly Entertaining Conspiracy Theories? What if Prop A Had Failed? Wash U Hosts "The Great Coal Debate"
The Beat the Tea Party Fundraising Challenge! Billionaires for Blunt Rally in Ozark!